Dissolve the dashi powder in 600ml hot water. Add the shiitake mushrooms and leave to soak for at least 30 minutes. Put the rice into a medium-sized pan, add the ginger and pour over the stock or lightly salted water. Bring to a boil and cook, uncovered, for 2 minutes, then turn down the heat to the lowest setting possible, cover the pan and cook gently for a further 7 minutes. Remove from the heat, cover and leave to stand for 10 minutes. Fork through the rice vinegar and seaweed seasoning. 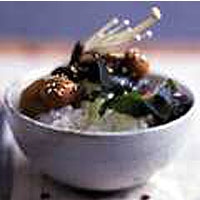 To serve, pile the rice into bowls (don't scrape the pan if the rice has stuck), and top with the mushrooms, a little rehydrated wakame seaweed and a few enoki mushrooms, if required. Sprinkle with toasted sesame seeds and serve.